SREC Market Monitor provides quarterly financial and demand analysis on the state SREC markets that account for nearly one-quarter of total U.S. PV installations. SRECTrade and GTM Research today release SREC Market Monitor, the solar industry’s first quarterly report series devoted to covering state SREC markets in the U.S. With SREC programs forecasted to account for nearly 25 percent of the 3.2 gigawatts to be installed nationally in 2012, understanding the risk and opportunity latent in SREC states will be imperative for industry players. At 72 pages, SREC Market Monitor: 2nd Quarter 2012 provides qualitative state-by-state SREC market analyses, regulatory policy updates affecting these markets, quarterly bid/offer pricing by state, data on SREC supply by state, historical SREC pricing, as well as updated RPS figures for each SREC market. The reports analyze the following markets: Delaware, Maryland, Massachusetts, New Jersey, Ohio, Pennsylvania, and Washington, D.C.
For more information on SREC Market Monitor and to purchase a copy, visit www.greentechmedia.com/research/srec-market-monitor. NEW JERSEY: Trading volume increased in New Jersey as prices stabilized in anticipation of new legislation signed in July. Forward contracts have seen the largest increase in activity as the spot and forward price curves converge. MASSACHUSETTS: After two years of significant undersupply and high SREC prices, rates of installation increased dramatically in Massachusetts, leading to a 50% drop in the 2012 SREC spot price. As market participants adjust to the reality of oversupply, it is clear that the market will trade well below the price support in the early part of the year. MARYLAND: Maryland continues to find support in the legislature for its SREC program. In May, the solar carve-out requirements were moved forward by two years. While this change has kept Maryland from facing a pending oversupply, the market continues to grow at a rate designed to meet requirements under the new legislation. DELAWARE: In April, Delaware launched the pilot of its SREC Procurement Program managed by the Sustainable Energy Utility (SEU) and administered by SRECTrade on behalf of Delmarva Power. The program represents a significant shift in the state’s SREC market that could become a model for other states struggling with SREC volatility. It is the first independent, statewide solicitation for long-term SREC contracts. WASHINGTON, D.C.: The Washington, D.C. market continues to be a bright spot for the solar industry. Given the small, urban footprint of the district, the solar carve-out is an ambitious piece of legislation. Constrained by space, smaller solar installations will dominate this market, naturally preventing the wild swings in supply that have led to volatility in other markets. PENNSYLVANIA: SRECs continue to trade in the $20 to $30 range with an occasional spike. Despite attempts by sponsoring lawmakers, Pennsylvania continues to struggle to garner support for a legislative fix that would accelerate the solar RPS and create demand for SRECs. OHIO: The market was particularly slow in Q2 as 2012 trading activity concluded. In-state demand had been strong over the past few years, but there has been a slowdown as supply has steadily grown to meet that demand. Meanwhile, the OH-adjacent market, which includes SRECs from states that border Ohio, continues to be significantly oversupplied. Interested in purchasing this quarter’s SREC Market Monitor? Click here to learn more. Posted September 12th, 2012 by SRECTrade. As of this writing, there were 28,155 solar PV and 437 solar thermal systems registered and eligible to create SRECs in the PJM Generation Attribute Tracking System (GATS). Of these eligible systems, 185 (0.65%) have a nameplate capacity of 1 megawatt or greater, of which 18 systems are greater than 5 MW. The largest system, the PSE&G utility pole mount project located in New Jersey, is 25.1 MW, and the second largest, located in Maryland is 16.1 MW. The third largest system, at 12.5 MW, is located in New Jersey. Delaware: The reporting year 2012 (6/1/12 – 5/31/13) requirement for DE equates to approximately 48,100 SRECs being retired. If all retired SRECs were of DE2012 vintage, approximately 40.1 MW would need to be operational all year long. As of September 11, 2012, 28.8 MW of solar capacity was registered and eligible to create DE SRECs in PJM GATS. As of September 11, 2012, PJM GATS reported the issuance of approximately 5,900 DE2012. Additional SRECs from prior eligible periods may also impact the market should there be a demand for these older vintage SRECs. 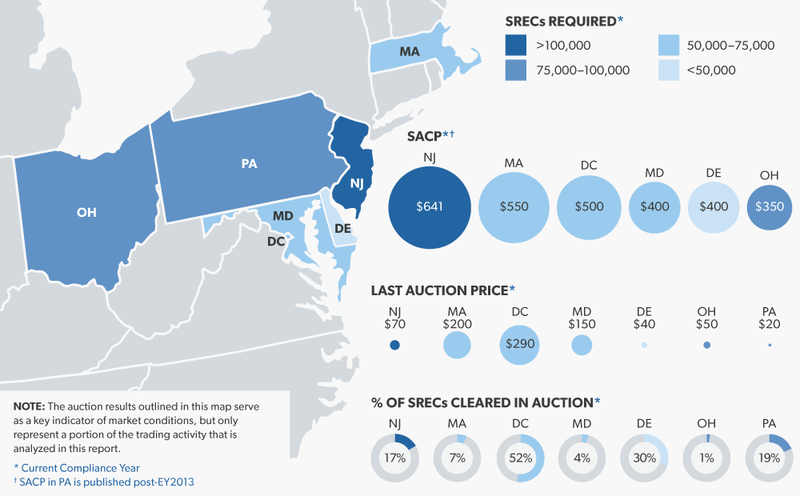 Maryland: As of September 11, 2012, 72.5 MW of MD sited solar capacity was registered to create MD eligible SRECs. A large increase came from a 16.1 MW project Constellation Energy commissioned at Mount St. Mary’s University. The 2012 reporting year requirement for MD equates to approximately 67,310 SRECs being retired. If all retired SRECs were of MD2012 vintage, approximately 56.1 MW would need to be operational all year long. As of September 11, 2012, PJM GATS reported the issuance of approximately 41,800 MD2012 SRECs. Lastly, there are MD sited SRECs available from prior eligible periods, which could be utilized for compliance needs in 2012. New Jersey: The New Jersey 2012 and 2013 reporting years require 442,000 and 596,000 eligible SRECs, respectively. For 2012, this equates to approximately 368 MW of capacity being operational all year long and 496.7 MW for 2013, assuming all requirements were met with current vintage year SRECs. As of September 11, 2012, 843.3 MW of solar capacity was registered and eligible to create NJ SRECs in PJM GATS. While this figure represents all projects registered in GATS, there are recently installed projects awaiting issuance of a New Jersey state certification number. This delay results in a portion of installed projects not yet represented in the 843.3 MW figure. As of July 31, 2012 the NJ Office of Clean Energy (NJ OCE) reported that 852.7 MW of solar had been installed in NJ. Estimates for August 2012 show a total of 876.0 MW. On July 23, NJ Governor, Chris Christie, signed into law legislation to increase the Solar RPS requirements. For details see the following: NJ Governor Christie Signs Bill to Increase Solar Requirements. As of September 11, 2012, PJM GATS reported the issuance of approximately 699,200 NJ2012 SRECs. This figure surpasses the current 2012 compliance year requirement of 442,000 SRECs by approximately 257,200 SRECs. Additionally, the second month of RY2013 generation was issued at the end of August. GATS reported a total of 196,700 total NJ2013 SRECs for the compliance year to date were issued; approximately 33% of the current year’s obligation (not considering the eligible oversupply from NJ2012). Ohio: Ohio’s 2012 RPS solar target requires approximately 95,300 SRECs to be retired by the end of the compliance period. At least 50% of the SREC requirement must come from systems sited in the state. As of September 11, 2012, 50.2 MW of in-state capacity and 96.7 MW of out-of-state capacity were eligible to generate OH SRECs. As of September 11, 2012, GATS issued approximately 40,400 in-state and 71,900 out-of-state OH2012 eligible SRECs. Additional SRECs from prior years are also eligible for the current compliance period, which may impact the current year’s requirements. Pennsylvania: The reporting year 2012 and 2013 requirements for PA equates to retiring approximately 49,450 and 78,750 eligible SRECs, respectively. If all compliance obligations were met using 2012 and 2013 vintage SRECs, approximately 41.2 and 65.6 MW would need to be operational all year long within each compliance period. As of September 11, 2012, 222.4 MW of solar capacity was registered and eligible to create PA compliant SRECs. As of September 11, 2012, PJM GATS reported the issuance of approximately 220,000 PA2012 SRECs. Given the oversupply during previous reporting years, there are also SRECs from the 2010 and 2011 reporting years eligible for the PA2012 compliance period. Additionally, as of September 11, 2012 GATS reported approximately 52,000 PA2013 SRECs were issued. Washington, DC: DC’s 2012 RPS amended solar target requires approximately 61,180 SRECs to be retired by the end of the compliance period. The figures displayed above demonstrate the capacity of systems eligible to create DC SRECs moving forward. These SREC and capacity figures do not take into consideration the amount of electricity delivered into the district that may be exempt from complying with the Distributed Generation Amendment Act increases, considering some electricity contracts may have been signed prior to the amendment’s implementation. As of September 11, 2012, 24.4 MW of capacity was eligible to generate DC SRECs. Additionally, as of September 11, 2012, GATS reported the issuance of approximately 18,000 DC2012 eligible SRECs. SRECs from prior years are also eligible for the current compliance period, which may impact the current year’s requirements. As of September 11, 2012, there were 3,134 MA DOER qualified solar projects; 3,118 operational and 16 not operational. Total qualified capacity is 121.3 MW, 110.4 of which is operational and 10.9 MW not operational. Electricity suppliers providing power to the state need to acquire approximately 73,400 SRECs in 2012. According to NEPOOL GIS, 14,479 Q1 2012 SRECs were issued on July 15, 2012. Additionally, 53,359 MWhs were reported to the MassCEC production tracking system for the 5 months covering April-August 2012.